The campaign to save Enderby House has taken a new stage with the formal setting up of the Enderby Group, a team of south-east Londoners who are campaigning to preserve the site where the international telecommunications revolution began in the 1850s. After a series of meetings called from early 2014 by industrial historian — and former local councillor — Dr Mary Mills, on 28 September Dan Hayton of the Greater London Industrial Archaeology Society and the Newcomen Society chaired a meeting in Greenwich that formally set up the Enderby Group, appointing officers and starting work on a business plan that aims to see the survival of the house. The group is already in touch with the Porthcurno museum in Cornwall, where many of Enderby’s cables came ashore, and with other interested parties. Enderby House, on the Greenwich riverside just north of the old Royal Naval College, became crucial to the history of the world’s communications after the Atlantic Telegraph Company was set up in 1856 to provide a telegraph link between the UK and North America. Originally called Telcon — for Telegraph Construction and Maintenance, created in a merger between Glass, Elliot and Company and the Gutta Percha Company — this is the oldest continuously operating telecommunications factory in the world. In its first 100 years the Enderby Wharf factory made 82% of the world’s subsea cables, 713,000 kilometres of cable. During the Second World War Telcon used the factory to build Pluto, the ‘pipeline under the ocean’ that delivered fuel to Normandy after D-Day in 1944. Several years ago Alcatel-Lucent, the current owner, sold the riverside part of its site, including the grade-two-listed Enderby House, to Barratt, the house development company. Alcatel-Lucent continues world-leading work on telecommunications technology on the rest of the site, while Barratt is well advanced with building houses and flats. Barratt is required to keep Enderby House — badly deteriorated in condition but partly protected by a fence — but the company has not yet found a function for it. That is why locals have set up the Enderby Group, to find a secure long-term use that honours and recognises its role in the telecommunications revolution. The wharf is named after Samuel Enderby, who had an oil and chandlery business in the area and bought an existing ropewalk on a former gunpowder test site to develop a factory to make canvas and rope. Enderby House was built on the riverside in the early 1840s. Woolwich-born General Charles Gordon is believed to have spent his last night in Britain at Enderby House before leaving for Sudan, where he met his end. The whole area around Enderby Wharf — and on the other side of the river — has had a long connection with telecommunications, running through to recent times. A century after TCM made the first cables, a young Chinese student called Charles Kao came to Woolwich Polytechnic — now transformed into the University of Greenwich — to study for his first degree, in electronic engineering. By then TCM had become part of the giant Standard Telephone and Cables group, and Kao went on to work there — where in the 1960s he came up with the idea that fibres of glass could carry information in the form of laser light. In 2009 Sir Charles Kao, as he now is, won the Nobel Prize for Physics for his work. Part of the cable for the first, unsuccessful attempt to build a transatlantic cable was made by Glass, Elliot at Morden Wharf, just downriver from Enderby Wharf. In 1862 Glass, Elliot used the Enderby Wharf factory to build a better protected — and successful — cable. The ship used to lay it across the Atlantic was Isambard Kingdom Brunel’s SS Great Eastern, built on the Isle of Dogs just across the river. From then until the 1970s the Enderby factory continued to make subsea telecoms cable, which was loaded onto cable-laying ships via gear that still survives on the riverside — though the ownership of that is still unclear. The Enderby Group wants to preserve the cable-laying gear and Enderby House as the birthplace of the international communications revolution. Please get in touch if you’d like to help. Hard Hat, the communications/PR consultants working for Barratt on the Enderby Wharf site, is holding a meeting on the development proposals in Greenwich on Wednesday 25 June at 18.00. Barratt is already demolishing the existing property on the site – part of Alcatel-Lucent’s historic cable factory, where most of the world’s undersea telegraph and telephone cables were made from the 1850s to the 1970s. 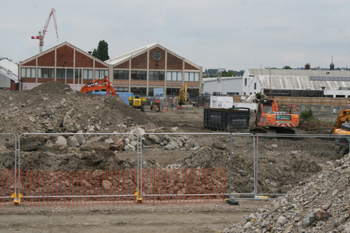 You can see the demolition site in the picture above, taken in May 2014. Alcatel-Lucent’s remaining buildings are in the distance. The meeting is at the Sherard Hall at the Forum @ Greenwich, which is in Trafalgar Rd, London SE10 9EQ (click here to see on Google Maps). Hard Hat is holding the meeting at 6pm because its previous meeting – on 27 March – was in the afternoon, too early for many people. Let’s hope Southeastern Railway is having a good day and people can get there on time. Nearest station: Maze Hill. If you plan to attend, please let Joshua Lindsay of Hard Hat know on jlindsey@hardhat.co.uk or 020 7636 6603 — at least so that they can put out enough chairs. Barratt’s site about the proposed development at Enderby Wharf is here.